DON'T MISS THOSE MAGIC MOMENTS! 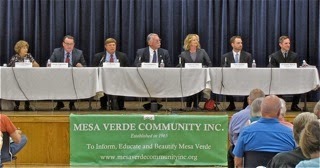 For those of you who missed the City Council Candidate Forum hosted by Mesa Verde Community, Inc. Thursday evening, the following is the replay schedule for the 2 hour, 10 minute program on Costa Mesa Television, Channel 3 on Time Warner Cable and Channel 99 on ATT U-Verse. As of this posting the streaming video of the meeting is not yet available. When it does become available you will be able to find it HERE. You've read what I wrote about it, HERE, and what Bradly Zint wrote in the Daily Pilot, HERE. Now view it for yourselves. Watch each candidate respond to the questions and form your OWN opinions. Watch Rita Louise Simpson show up late to the podium, then seem perpetually lost during the entire evening. Watch your mayor attempt to bully other candidates and talk longer than permitted by the rules. Sound familiar? It should - that's his modus operandi - to stifle opposing views and make up his own rules as he goes along. Decide which candidate(s) YOU think did the best Thursday evening. I thought Katrina Foley and Jay Humphrey looked steady and ready. I thought Chris Bunyan and Tony Capitelli did well - better than I anticipated. I thought Al Melone did better than two years ago, but still demonstrates an incomplete grasp of important issues. 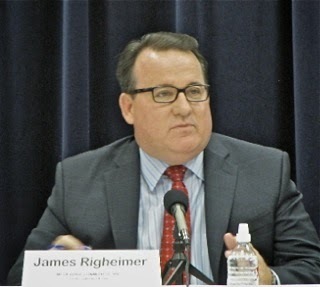 I thought Jim Righeimer demonstrated the character flaws that he's shown us since he took office. However, YOU watch and YOU decide. But, don't look for Lee Ramos - he had better things to do Thursday night. Next stop, the Feet To The Fire Forum on September 18th at Orange Coast College. 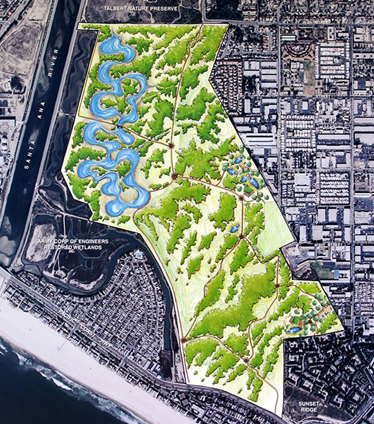 Next Monday, August 25, 2014, the Costa Mesa Planning Commission - under the "dynamic leadership" of Chairman Jim Fitzpatrick - will meet to discuss a short agenda, which you can read HERE. The meeting begins at 6:00 in City Council Chambers at City Hall. 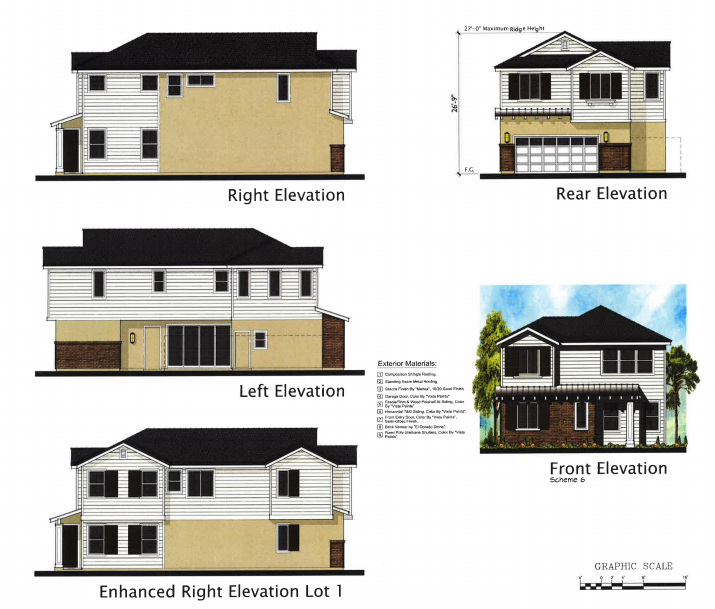 The Consent Calendar includes the revocation of two Conditional Use Permits for property on Pomona Avenue, HERE. 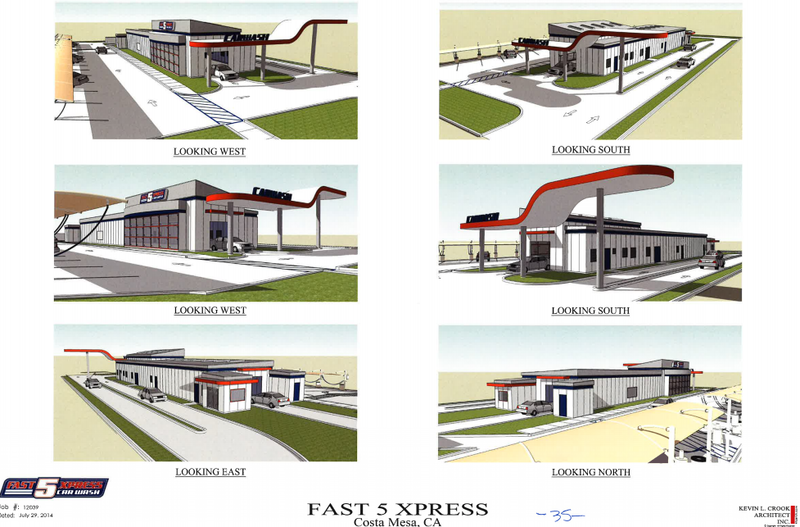 Public Hearing #1, HERE, is a request for a Conditional Use Permit to demolish the defunct existing Beacon Bay Car Wash at at 481 East 17th Street and replace it with a Fast 5 Express Car Wash. This seems like a good solution. Public Hearing #2, HERE, is a request to replace 14 apartment units with 11 fee-simple ownership units at 1631 and 1645 Tustin Avenue, at the corner of Ogle Street, each of which will be greater than 2,000 square feet - right around the corner from that Car Wash. It appears that the only significant request for adjustments is on the front setback, which should be 20 feet but 12 feet is requested. Unless Fitzpatrick tries to dazzle us with his knowledge of car washes - he used to be in the business of car wash processes that used what amounted to a mouthful of spit to clean your car - we should be out of there by 7:00 p.m. In a press release yesterday the Costa Mesa Police Department announced the graduation of five officers from the Orange County Sheriff's Regional Training Academy. According to the information provided, 44 officers, from 14 local police departments, were honored during the ceremony last night for officers who successfully completed the six-month training program designed to prepare officers for the streets. Course instruction included tactical firearms use, arrest and control techniques, laws of arrest, physical training, emergency vehicle operation and practical scenario-based field problems. 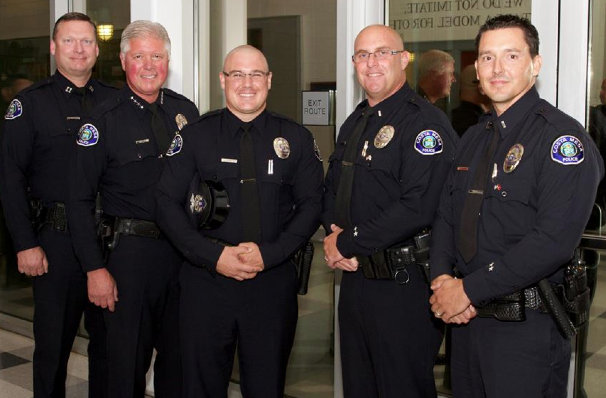 Costa Mesa Police Department's five attending officers all successfully completed academy instruction. 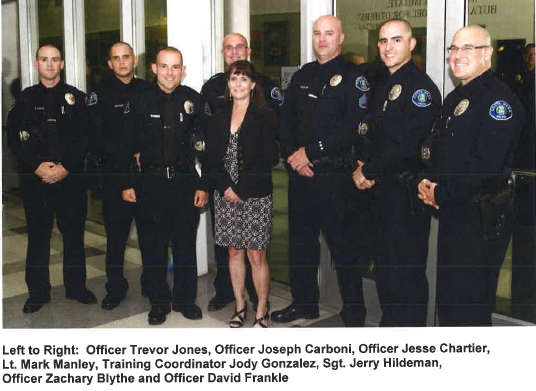 Graduating Costa Mesa Police Officers included Officer David Frankle, Officer Zachary Blythe, Officer Joseph Carboni, Officer Jesse Chartier and Officer Trevor Jones. Officer Frankle was nominated by his class peers as their class president. Frankle was also ranked as the overall #1 graduate in the class. He was presented with the Outstanding Officer Award and Written Examination Award to recognize his distinguished performance earning the highest average exam scores, and earning the highest number of overall points in academy performance. Kudos to these fine young men for their completion of training. They will now work with training officers in the CMPD before working independently on the streets of our city. Kudos to Officer David Frankle for his outstanding performance and leadership. We welcome them to our city and look forward to meeting them as they do their part to keep us safe. They will start to work Monday and spend at least the next four months under the guidance of a Field Training Officer before they begin to work on their own. There was value for most of the 150 or so people who sat in the audience at the Costa Mesa City Council Candidate Forum hosted by Mesa Verde Community, Inc. for a little over two hours last night. Even those of us who follow politics closely learned a few new things, and had some old opinions reinforced. MONEY WELL SPENT ON RAMOS? Seven of the eight candidates participated. Lee Ramos apparently chose to blow this forum off. He wasn't missed, but I suspect those folks who have made him the second-highest campaign contribution collector might have been wondering about how they spent their money. The formal part of the evening was preceded by a "meet and greet" period, which included background music by Michael Donohoe - a nice touch. The crowd of around 150 people was, for the most part, attentive and respectful. I recognized about a third of that number. The rest were new faces. Most sat quietly in their seats, listening intently, although there were some Righeimer supporters lurking in the back of the room. 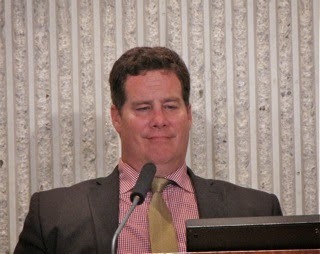 Moderator Darnell Wyrick, President of Mesa Verde Community, Inc., was off his game last night. Although the event was scripted, he managed to botch things right from the start. He forgot to let the candidates present themselves and didn't offer them a chance for a closing presentation. Plus, in the midst of the event he continually got confused about which candidate was to speak next. And, throughout the evening he referred to the candidates as "Mr." or "Mrs." - except for Jim Righeimer, to whom he referred as "Mayor Righeimer" every single time. The format was to ask each of the candidates the same question, rotating the chance to answer first with each new question. The candidates got two minutes each to answer the first three questions, one minute each for the next three, then thirty seconds each for a few more. The pace was brisk. Let me say here that I introduced myself to candidate Rita Louise Simpson and also met her husband before the program began. She seems like a very nice woman, but she is absolutely clueless on almost every important city issue! She supports the Charter and wants something done about the Unfunded Pension Liability, but doesn't understand why in either case. When she did talk about those issues she apparently was reading from a script - or so it seemed - straight from Tea Party Tom Pollitt's playbook. It was sad to watch. Wyrick's first question asked the candidates their opinion of The Charter. Chris Bunyan, Katrina Foley and Jay Humphrey do not support the Charter. Tony Capitelli, Simpson and Righeimer supported it and Al Melone told us that, while he supports the Charter, he's not enthusiastic about it and thinks it's getting too much attention. The next question asked about their views on Development. Capitelli told us it's the council's responsibility to add value to the community, but expressed concern about parking and open space. Foley was for balanced growth and cited her time on the Planning Commission and City Council when the negative impacts of developments were considered. She stressed quality of life issues. Humphrey spoke of the General Plan update in which he participated when last on the council, citing the need for development plans to be consistent with the approved General Plan. he referred to unbridled growth to cancer. Melone went off on a tangent about taxes and the proliferation of fast food restaurants. Then it was Righeimer's turn and he deflected any criticism of his regime's development frenzy by blaming Orange Coast College for growth and the 55 Freeway for traffic. He spoke of the development plans in the works for OCC and said "nobody says a word about that!" Simpson said, "I've seen some of the developments. The traffic is doing fine." As I said, she's clueless. Bunyan gave the best response, citing the transient nature of the OCC students, the recently approved apartment complex at 125 Baker Street and mentioned the very pro-development City Council. They were then asked how to manage the unfunded pension liability. Foley cited the recent agreement in which the Miscellaneous Employees agreed to a higher contribution, mentioned that this is not just a local problem, but a state and federal issue, too. She encouraged a more collaborative approach with the employees - change the hostile work atmosphere. She said the current council just talks about it but does nothing to fix the problem. Humphrey suggested a one-time pay out option for our pensions. Melone said he doesn't believe in paying down the liability, stating that as long as the City remained financially solvent the pensions will just keep on being paid. Righeimer went on one of his "we love our police and our fire" rants, accused Foley of quitting the council, said "people don't understand the math." He, condescendingly, made a reference to "the adults showing up to negotiate for the employees" and feigned anger about the issue. It was way, way too contrived. Simpson said the pension liability is unbelievable. Duh! Bunyan said the days of sweet pension deals are over, then criticized CalPERS for its role in this mess. 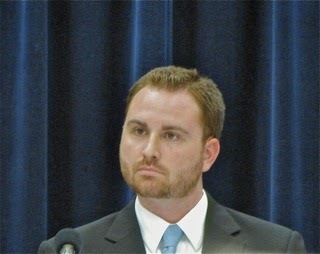 Then Capitelli criticized the participants for their hostility - a comment obviously directed at Righeimer, and said, "It's time to stop posturing and work toward solutions." Yep. Then came the one-minute-response questions. The first one asked the candidates what made them qualified for a council seat. 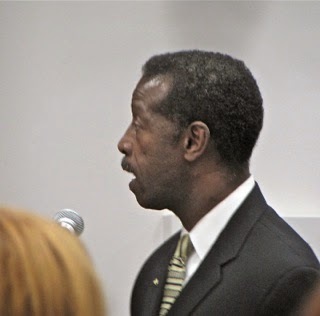 Humphrey cited his previous council experience, his 37-year residence in the City and his long, successful business career. Melone cited his CPA and MBA and his ability to analyze issues. REST ON HIS RECORD - GREAT! Righeimer said, "I'll rest on my record. ", then blasted Foley for being part of a council that "blew through $35 million in reserves" - neglecting to mention that she helped build those reserves and they were available when they were needed during the severe economic downturn. He patted himself on the back for being responsible for "$40 million in roads and alleys" - which he was not. He said, "Sometimes when you make an omelet you have to break a few eggs. ", as though that was relevant to something. Then he said "Sometimes you have to be an adult." He sometimes speaks in tongues - this was one of those times. Personally, I was very happy to hear him say he would rest on his record. That record is one of dictatorial arrogance, bullying, rule-breaking and failure to plan before acting, which has resulted in millions of dollars in unnecessary legal fees. 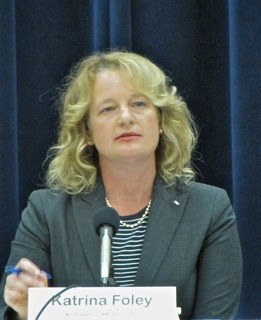 Simpson cited her experience as a teacher and her time at the Auto Club. Capitelli cited his law degree, his years working as a federal government employee and his experience and interest in housing issues. He stressed his collaborative approach. Foley cited her proven record of getting things done, and used as examples her time on the council when those street improvements actually began; the fact that she helped fight off the sale of the OC Fairgrounds and improve the traffic situation on Broadway. She cited her successful business in Newport Beach and said, as a lawyer, she knew how to collaborate. Bunyan fired off five ideas: 1) Put Public Comments back at the beginning of Council meetings; 2)more affordable, transitional housing; 3) Stop high density development; 4) More government transparency and 5) Resolve the illegal trail in Fairview Park. Capitelli also cited the need for affordable, transitional housing, the return of the Illumination Foundation, the need for more mental health workers and the need to NOT kick out the motels, which provide housing. They were then asked about changing the Westside Overlays. Righeimer said the question is incorrect, that the projects don't generate more traffic, the 55 Freeway does. Simpson had no answer. Bunyan disagreed with Righeimer, citing the traffic snarl at 17th Street and Newport Boulevard and suggested more attention be paid to the General Plan Circulation Element. Capitelli said it's time to take a second look at the Overlays. Foley recalled the original approvals and intent and said the implementation is off the mark. Humphrey said the plans have been corrupted, increasing density. Melone agreed with him. The next question asked about the changes in commercial zoning. Simpson had no answer, then complained about the "Alzheimer homes".... As I said... Bunyan said a side effect of the changes are a loss of harmonious areas. He said we should keep existing businesses. Capitelli said he's in favor of small businesses..
Foley said she favors a balanced approach, citing the need to retain the "small town feel". Humphrey agreed, and said we are driving businesses out of the city. He also cited the increase in high density developments. Melone made some remark about his mechanic having a better breeze at his Westside shop than Melone has in Mesa Verde. Righeimer blamed Foley for the density! Then began the questions with 30 second responses. The first was about Banning Ranch. Bunyan said "Save Banning Ranch." Capitelli said we can't do much since it's in Newport Beach. Foley agreed, and stated that we will get 100% of the traffic from the project. They were then asked about Fairview Park. Capitelli said the park should be protected. Foley agreed 100% and that the current Master Plan should be followed. Humphrey said keep it as natural as possible and referred to the current activities of the US Fish and Wildlife in the park. Melone agreed with the previous. Righeimer said continue the current Master Plan. Simpson said she was glad "the Indians came to talk with us." As I said... Bunyan said protect Fairview Park - "save it, don't pave it". Next came a question about Budget priorities. Foley said reduce the legal fees. Humphrey, inexplicably, seemed to have a major brain burp and came up with a mumbled statement about keeping the city fiscally sound. Melone said paving the streets was good, but spending money to re-landscape medians is unnecessary, and that we should be re-building our reserves. Righeimer went into a song and dance about having a $135 million budget and said we "don't budget to build reserves, but sometimes we have a surplus." Simpson muttered something about the Charter and Unfunded Pensions. Bunyan said the Charter can't do much but "Jim would burn down the city to get it passed". Capitelli suggested Supportive Housing be at the top of the list. Next up were questions from the floor. This is where things got more than a little muddled. Wyrick attempted to blend a few questions into one, or one and a half. Anyhow, it began with the Sober Living homes and what we can and should be doing about them. Humphrey, first at bat on this one, said it's a complicated issue and that we should be seeing what other cities are doing. Melone hadn't studied it. Righeimer said there are 200 such home in the city, mentioned his new Task Force - which has shown no results yet, by the way. Humphrey wondered why there was no ballot measure on this one. Simpson made a peculiar comment about tobacco addiction. 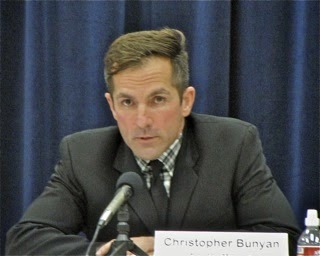 Bunyan referred to the amicus brief Costa Mesa filed to assist Newport Beach with its law suit. Foley said we should be working with regulators to block whole neighborhoods. Then came question asking when we would be at full strength in the CMPD. Melone said they are "working day and night" to hire new people. Righeimer said Chief Gazsi is doing a great job, that we'll add 20 more people before the end of the year and that "We'll be fine." Really? Well, I guess that's all we need to know! Yes sir, staffing is off 30%, our cops are working horrendous overtime hours and "We'll be fine." Thanks, Mr. Mayor. I missed Simpson's and Bunyan's responses. When Capitelli tried to answer by stating that he's been told we have only 5 cops on patrol at a time Righiemer interrupted him and tried to speak over him. The audience shouted him down! Foley said it's important to increase the staffing levels because crime is on the increase. Give the chief the freedom to hire. Humphrey cited the reasons for the loss of officers - the hostile workplace and the hiring freeze. Bunyan cited the Mesa Verde Library and said it needs some TLC. Capitelli said he likes the mayor's plan. 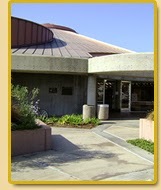 Foley said support the Friends of the Library and agreed about the Mesa Verde Library. Humphrey said he strongly supported funding a library, then referred to the recent "raid" of the library funds in the budget to re-plant brand new medians in Mesa Verde. Melone said it's more important to re-build the "rainy day fund". Next was a question about why apartment developers exempt from paying park fees. Actually, it took awhile for that question to get fleshed out. Simpson had no answer. Bunyan said, "Ask Jim that one." Capitelli had no answer. Foley said the staff is working on a plan to charge park fees for apartment developments. Humphrey concurred and expanded on that idea. Melone tried to give Righeimer his time. He was rebuffed. Righeimer quoted the Quimby Act, which maybe two people in the audience understood. When asked about how to bring balance to economic development, Capitelli said provide more support to small businesses. Foley said focus on tourism, including raising the TOT. Humphrey said stop driving businesses away from Costa Mesa. Melone liked tourism, then complained that businesses bring traffic! Good grief! He said he was grateful for South Coast Plaza. Righeimer did a riff on how our city brings in more Sales Tax dollars than any other city of similar size. He said, "The City is in great financial shape!" Simpson said she liked South Coast Plaza because you can park there. As I said... Bunyan said play to our strengths - being the City of the Arts and the apparel industry. They were then asked about campaign funding, and if they received any outside finances from unions or developers and how much. Foley said she received about $18,000, of which $7,500 came from the Newport Beach Police Association and $2,500 from another police agency - the Sheriff's, I believe. 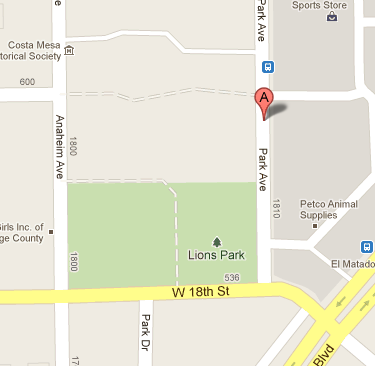 The remainder comes from Costa Mesa residents. Humphrey said 100% from Costa Mesa residents. Melone said he's taking no contributions. Righeimer then went on a rant about Foley's admission about the contributions, but didn't answer the question. Simpson said she's not taking any. Righeimer, in response to jeering from the crowd, said, "It's a public record - look it up!" Bunyan said "Zero and Zero", but that the bulk of Jim's are coming from outside. Capitelli said "Zero and Zero", and that he'd raised $19,000 from family and friends. Foley talked about the need to raise funds for campaigning. 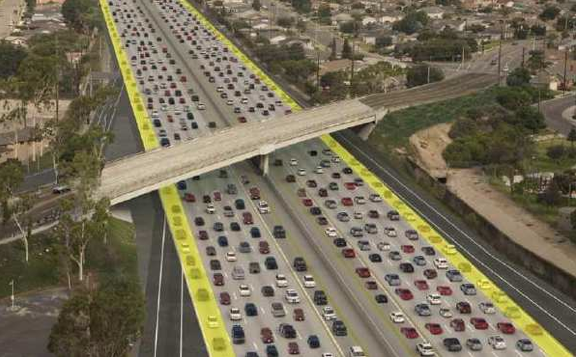 Then there was a confusing question that turned out to be about the ballot measure Righeimer proposed for November giving the voters a chance to sign in on the proposed toll lanes on the I-405 freeway. Foley said she opposes the "Lexus Lanes", but that it didn't need to be on the ballot. Humphrey opposes the toll lanes, but also wondered why it needed to be on the ballot. Melone said it's like Banning Ranch - we have no control over it. Righeimer riffed about the toll roads costing $1.3 billion and that he wanted to put the issue on the ballot so the voters could tell the governor how we felt. Simpson said we paid for the road and that they need to be maintained... clueless. Bunyan didn't favor the toll roads and thought the ballot measure was only symbolic. Capitelli said we all want to stop the toll road. Finally came a question about dividing the city into voting districts. Righeimer said the City is too small for districts and that he's not real positive about it. Humphrey said the residents could request the change whether a Charter or General Law City, and said the city is not big enough. Foley used the School Board as an example of why it's not necessary. Melone said we should just elect the best people, regardless where they live. Capitelli said districts might take some dollars out of campaigning. Bunyan said they would make campaigning easier. Whew! I'm sure you're even more tired of reading this tome than I am of writing it! The folks from CMTV were filming the event and it will enter the playlist rotation next Tuesday at noon. Check the city web site for the actual times. It will also be available on streaming video in a couple days. So, my take on the meeting... it was worthwhile, but needed a tighter rein. I'm grateful to the good folks at Mesa Verde Community, Inc., for holding the event. I'm sorry they didn't do a better job of publicizing it - there were a lot of empty seats. I was not surprised at how it went. 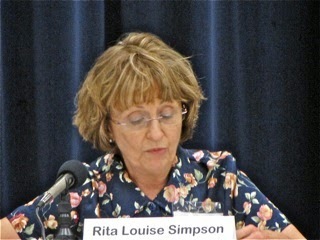 Rita Simpson is clueless about most issues. Al Melone knows more than he did two years ago, but not much. Chris Bunyan is back and, quite honestly, added a lot to the discussion last night. Tony Capitelli is clearly a bright young guy with an equally bright future. I liked most of his answers, but not all of them. Unless something changes between now and when I mail my ballot, he won't get my vote. 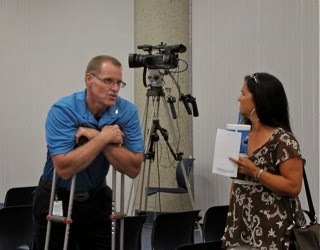 Katrina Foley and Jay Humphrey demonstrated that they've got what it takes to be elected to the council again. Both have the experience, expertise, intelligence, compassion and patience to do a good job for the residents. 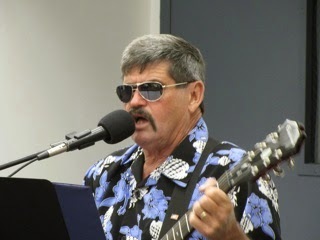 Jim Righeimer demonstrated for the audience just why he should NOT be re-elected. He's an arrogant, dictatorial, condescending bully. He interrupted several speakers because they challenged what he said. He decided to keep speaking when his time was up because he decided it was important. That's his style. The rules are for somebody else. He told us he will "rest on his record". Great, because it's a record of fiscal irresponsibility, chaos and divisiveness. I look forward to the next forum - the Feet To The Fire Forum - on September 18th. Maybe my neighbor, Old Lee Ramos will show up for that one. 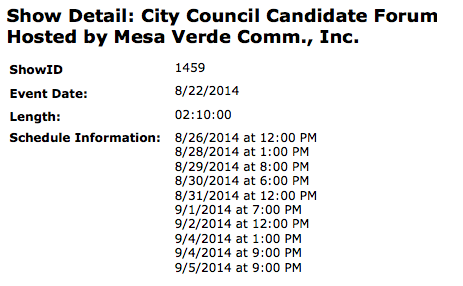 As most of you already know, Mesa Verde Community, Inc. will be hosting a forum for the eight (8) candidates for Costa Mesa City Council tomorrow, Thursday, August 21, 2014 at the Neighborhood Community Center, 1845 Park Avenue (Lions Park) beginning with a "meet and greet" at 6:30 and a two-hour program commencing at 7:00. Mesa Verde Community, Inc. President Darnell Wyrick will moderate the event. I find it VERY curious that my Eastside neighbor, Lee Ramos, has decided to blow this forum off. According to Brad Zint's article in the Daily Pilot, HERE, Ramos' Campaign Manager Dennis Popp - the pompous pontificator and publisher of a nearly incomprehensible blog - said Ramos "will be focusing on meeting with voters rather than performing at PR events." That's a curiously condescending description of an event being conducted by an organization of which he is Treasurer! In election cycles past this forum has been a valuable opportunity for voters to hear the positions of the candidates and assess their ideas. Popp goes on to be further quoted as saying, "Our key issue is allocating time and resources. We chose to emphasize contacting residents to learn what they think, rather than to talk to them from the stage." Really? So, in an election so critical to the future of the city, Popp apparently doesn't want a large group of interested voters to have the opportunity to hear what his candidate thinks about issues, huh? Very interesting. 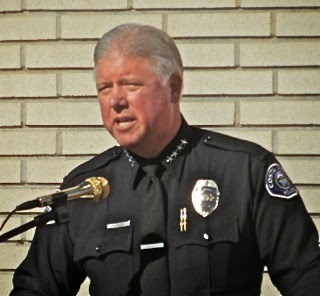 Even more curious is the fact that Popp told Zint that his man, Ramos, DOES plan to attend the Feet To The Fire Forum on September 18th - an event that has had much more aggressive questioning in the past. 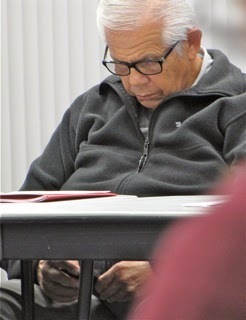 I hope Ramos, shown here texting during a Fairview Park Citizens Advisory Committee meeting, has a change of heart and does attend the forum Thursday. The voters deserve an opportunity to hear his thoughts on what he thinks are the biggest challenges the city faces, and his potential solutions. It's difficult to know what to make of his decision to duck this event. In any event, I'll see you there... should be an interesting, informative, evening. OK, Sports Fans, it's time to get this campaign season underway! 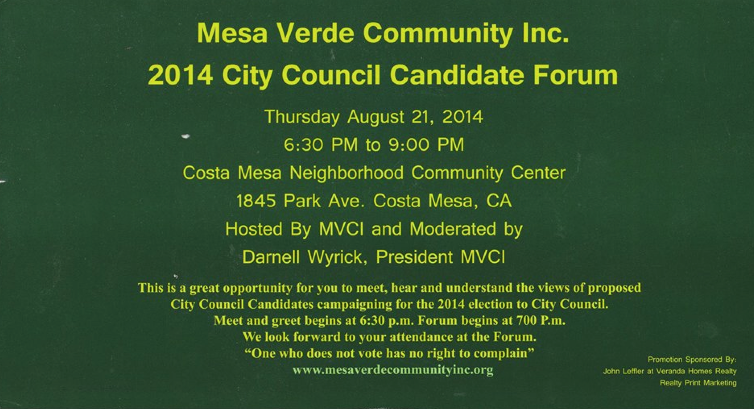 Thursday, August 21, 2014, our friends from Mesa Verde Community, Inc. will hold the first of several Costa Mesa City Council candidate forums at the Neighborhood Community Center, 1845 Park Avenue (Lions Park). The event begins at 6:30 p.m., with a chance to meet and greet the candidates. The formal part of the forum will run from 7:00 - 9:00. 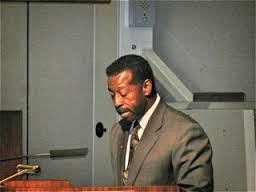 Their President, Darnell Wyrick, will moderate the event. KATRINA FOLEY - Former council member and current trustee of the Newport-Mesa Unified School District. A lawyer, she can present the meat of issues well and seems to have boundless energy. 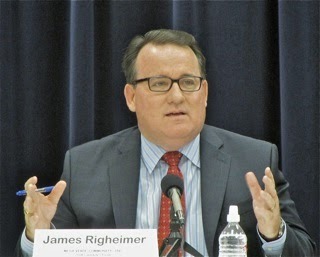 JIM RIGHEIMER - Current mayor and architect of many ill-conceived schemes during his tenure on the council. It will be interesting to watch him spin his performance Thursday evening. JAY HUMPHREY - Former councilman and dedicated community activist who attends almost EVERY important public meeting in the city and asks intelligent, respectful questions and also provides possible solutions to problems. 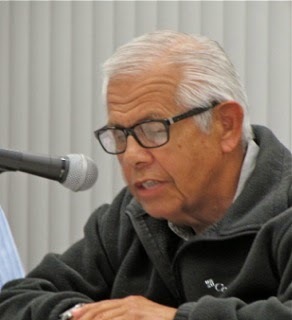 LEE RAMOS - My Eastside neighbor - appointed member of both the bogus Charter Committee and the Fairview Park Citizens Advisory Committee - is a fella about my age. He says he's lived in Costa Mesa since 1947. His signs say "Vote for Lee", so I'm confused... is he trying to attract the "large" Asian vote, or is he trying to duck his Latino heritage? Heck, we just hope he stays awake for the entire event. TONY CAPITELLI - First time candidate, homeless activist, son-in-law of Newport Beach councilman and Assembly candidate, Keith Curry and employee of Congressman Dana Rohrabacher. He's a nice young fella. AL MELONE - A spoiler from the campaign two years ago, when his presence on the ballot sucked up valuable votes in a very tight election. He brings to the race a platform with one plank - the dog park. He's demonstrated little patience as he addressed the council and commissions in the recent past. CHRISTOPHER BUNYAN - He ran unsuccessfully in the past, left town for a few years and has now returned to run again. It will be interesting to get his take on critical issues, since he doesn't show up an any of the important city meetings. He markets himself as a Banning Ranch activist. RITA LOUISE SIMPSON - A late addition to the ballot, we don't know much about her except she recently retired from the Auto Club, has lived in Costa Mesa for nearly 30 years and seems aligned with Righeimer's views. We'll know more, hopefully, by 9:00 p.m. Thursday. So, now it begins. This will be our first chance to see all the candidates together, and to get a real sense of what this campaign season is going to be like. I, and many others, have speculated that it may be the nastiest, most expensive, campaign in city history. We'll see.